Back in June, we hosted a 48 hour design sprint linking creators, technologists and makers from Mexico City and Dundee. The themes of civic awareness, collaboration and innovation spawned imaginative, experimental and playful responses and some of the best outputs will be on show at the V&A in London as part of Digital Design Weekend, two days of events celebrating contemporary digital art and design during the London Design Festival. There's a wealth of experimental projects on display, including Small Society Lab Dundee's GIF Wall offering city snapshots. Highlights from Mexico City include Napz (below) a wearable tech sleep mask, which programmes, analyses and schedules lucid dreams. As well as Digital Futures UKMX, there’s plenty more to get involved with at the Digital Design weekend, including interactive installations, demonstrations of robotics, inventive electronics, workshops, family activities and more. You can download the full programme here. The V&A Digital Design Weekend coincides with the London Design Festival. 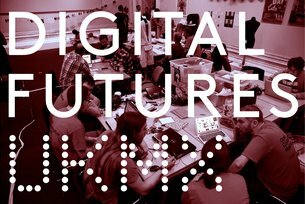 Find out more about the birth of Digital Futures UKMX here. Digital Futures UKMX was developed and designed by V&A in partnership with the British Council. Thanks to our partners Laboratorio para la Ciudad, Centro de Cultura Digital, Laboratorio de Arte Alameda, Social Tic, Hacedores.com, Small Society Lab Dundee, Uniform, Interaction Design Studio Goldsmiths University of London.